The camera floats through a slap-dash architectural model, following a trickle of water originating from a fountain stuck through a passport picture, gargoyle-style, flowing past miniature cities consisting of slabs of transparent plastic, slipping into a next scene. 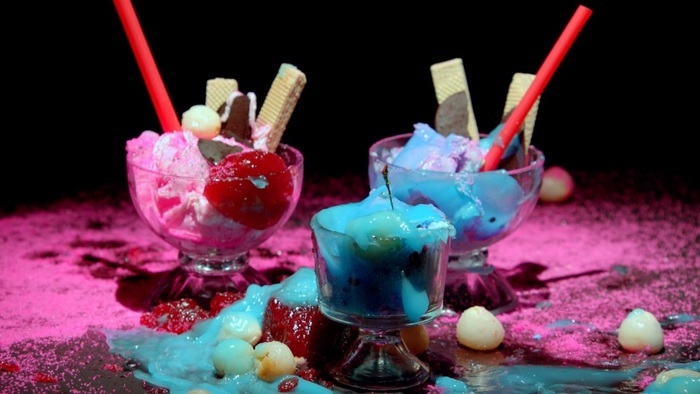 Garishly colored deserts are bombarded with Jell-O and chocolate sprinkles. Fruit is hooked up to seriously scientific machines with electric cables. And TV-commercials from the eighties spin out of control. In the meantime the swinging soundtrack gets louder, whipping the visual weirdness into a frenzy, only to be cut short from time to time by a disembodied voice-over pretending to explain the scenes but actually adding to the overwhelming sense of alienation. 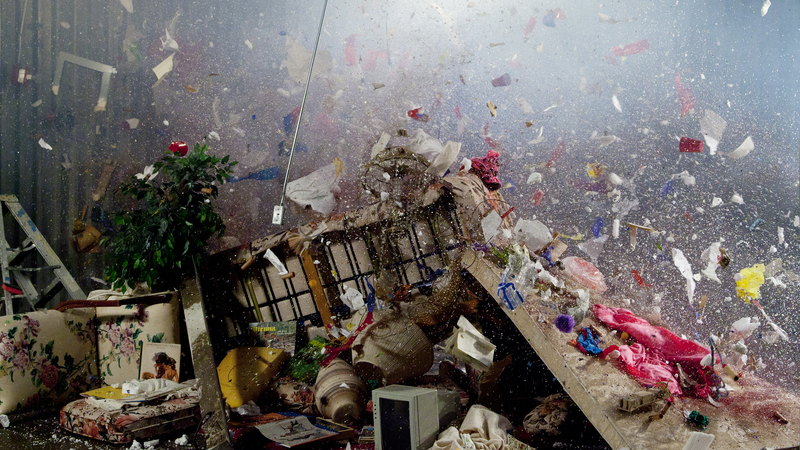 The Floating Chain by Jonah Freeman and Justin Lowe is a trip. You can easily get sucked into the half hour video and forget you’re in a hotel room in downtown Barcelona. Because that’s where Marlborough Barcelona is screening the video’s European premiere: the 2015 edition of Loop. 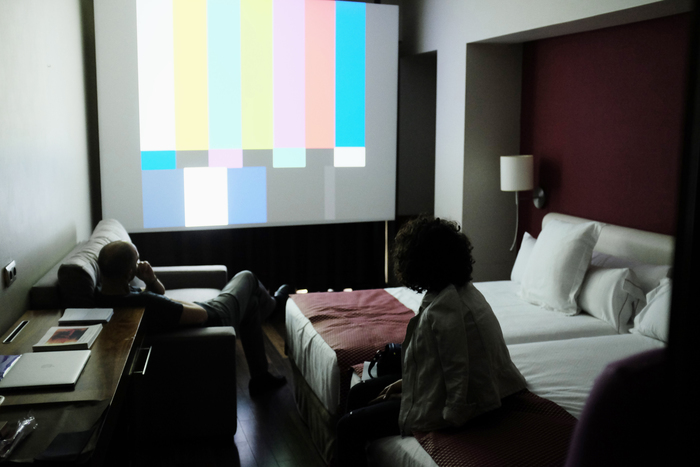 For three days the Hotel Catalonia Ramblas is hosting the art fair that, 13 years ago, was the first to be exclusively dedicated to video art. This year 49 galleries are participating, of which three are in a separate sound art section. 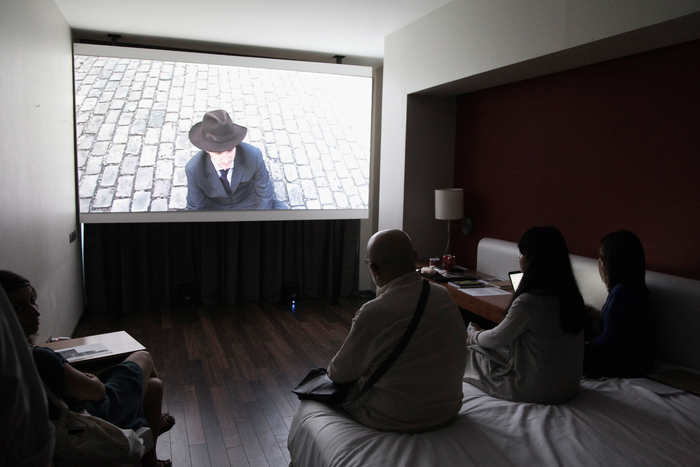 The hotel rooms have been transformed into miniature cinemas, offering the kind of concentrated viewing experience you’ll never have in a regular fair or even a gallery. It helps, of course, that the selection on offer is of excellent quality. That said, Loop is far from complete. Some strands of contemporary video art are missing from the roster, most notably post-internet art, and London and Berlin galleries are underrepresented in the list of participants. Possibly because gallerists choose to present works fitting the intimate setting, a lot of works are small and personal. Politics is not strongly featured, Fernando Sánchez Castillo’s Azor/Guernica Syndrome (Art Bärtschi & Cie) being one of the few exceptions. In this work the artist has Franco’s former pleasure yacht demolished, which after the generalissimo’s death was discarded by the Spanish government and served as a restaurant stranded on a parking lot somewhere in the Iberian heartland. From the debris Sánchez Castillo—always interested in the relationship between art and the representation of power—produced a modernist abstract sculpture. It now sits in room 31, reminding the locals of a not so distant past. Quite a few works at Loop have a documentary slant to them, threading a thin line between cinema and video art. Clarisse Hahn (Jousse Enterprise gallery) focuses on landless peasants in Mexico, and Cyrus Kabiru (SMAC Gallery) tells us about the history of fixed-gear bicycles from Kenya, nicknamed Black Mamba. Their approach is rather traditional compared to Chien-Chi Chang’s (Chi-Wen Gallery) who beautifully paces his tale about Chinese worker migrants in New York by mixing black and white stills, film clips in color, short intermittent texts, and a sometimes disconnected audio track. But it takes someone like Dragos Alexandrescu (Gallery Taik Persons) to take a big subject—in this case the impact of technology on the human capacity to connect physically—to a more abstract, even poetic level. In little over two minutes a choreography of swiping and typing hands accompanies an absurdly disconnected dialogue between a man and a woman. Video as a means to reflect on, add to, or transform other media and art forms seems to be a dominant trend this year. François Bucher (Alarcon Criado) refers to a little-known work by French author Jean Genet in his reconstruction of a staged kidnapping at a university in Medellín. Michal Helfman (Sommer Contemporary Art) collaborated with choreographers Noa Zuk and Ohad Fishof to create a dance reminiscent of an assembly line. And Jacco Olivier (Galerie Ron Mandos) animates abstract paintings. But the absolute best in this bracket is João Onofre (Marlborough Contemporary). 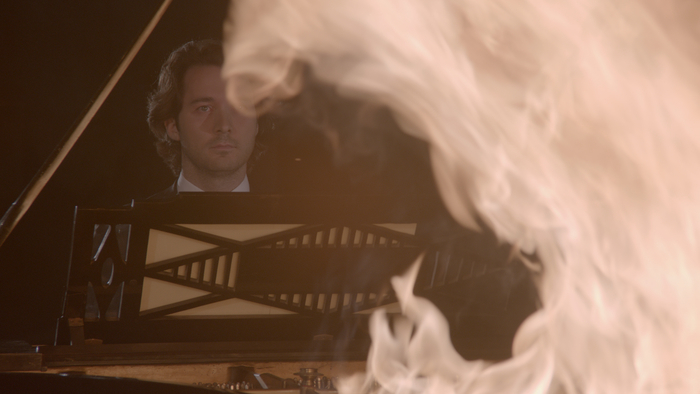 In Tacet he gives John Cage a run for his money by having his iconic composition 4’33’’, the so-called "silent piece," performed by a pianist who, before sitting down for four and half minutes of not touching the keys, sets his grand piano on fire. This is a prepared piano if there ever was one. Installing video art in a rather small hotel room is an art form in itself. If done well, it really adds to the work. Emma van der Put’s Rincé Alien (tegenboschvanvreden), a coolly objective but at the same time loving peek at vagrants in the Brussels underground, gains a sculptural quality because of its billboard-like presentation. True multi-screen installations are rare at Loop. Being Seen Trying by Fabien Charuau (Chatterjee & Lal) is a notable exception, consisting of five screens showing Indian devotees at prayer overlaid with face-detection software. Charuau is amongst a select group of artists venturing into medium-specific experiments. 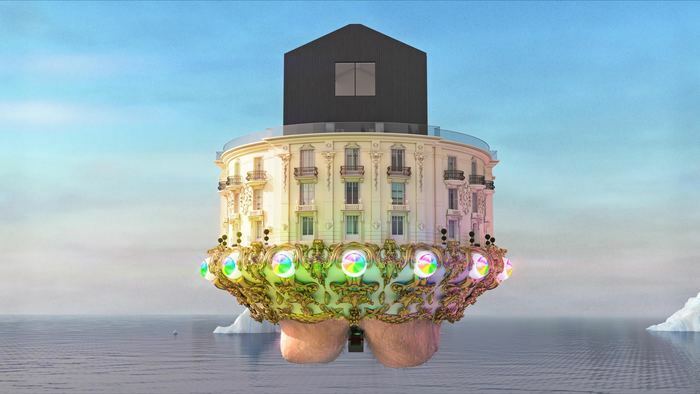 Of the animations on show Jonathan Monaghan’s Escape Pod (Bitforms Gallery) is the absolute best. It's a dystopic science fiction short featuring a golden reindeer, a UFO with hairy buttocks, luxury goods, and levitating phalluses. Less outrageous but quietly exiting is Puck Verkade’s Solitary Company (Dürst Britt & Mayhew). Her portrait of a small Icelandic community is framed in a constantly moving circle, invoking associations of binoculars, a globe, a crystal ball, a wheel, and a kaleidoscope. Seeing all these wonderful works in such a conducive environment makes you almost forget they’re for sale as well—it’s a fair after all. And video art proves to be a reasonably priced medium, with even works by big names available for reasonable prices. The average price at Loop is around 3000-4000 euro for works in low editions (usually 3). Susan Philipsz doing Ziggy Stardust (Ellen de Bruijne Projects) for merely 500 euro is a downright steal, but a work by Mel O’Callaghan (Galerie Allen) for 3,500 euro is not bad either. Some acquisitions, however, require a heftier wallet. Whoever wants to take home The Floating Chain will have to shell out 75,000 dollars. But that sum buys you a truly exceptional work. Loop Barcelona 2015 takes place at Hotel Catalonia Ramblas, Carrer de Pelai 28, Barcelona, June 4–6, 2015.